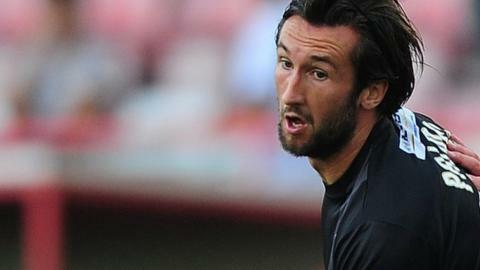 Grimsby extended their unbeaten run away from home to 11 league matches with victory against Conference play-off hopefuls Eastleigh at Ten Acres. Ollie Palmer slotted the game's only goal in off the post after catching Jamie Turley in possession. Shaun Pearson had an header cleared off the line by Eastleigh's Daniel Spence and Ross Flitney kept out Craig Disley's follow-up effort. Keeper James McKeown denied Craig McAllister's late on to ensure victory. The win moves the fourth-placed Mariners to within a point of second spot, while defeat leaves Eastleigh two points adrift of the top five. "I do think for large parts we played very well tonight and at the end we had to stand up to the physical threat of Eastleigh, which we know there is. "We should have put the game to bed in all honesty. "It was a big pitch and a long journey down but all credit to the players and a thoroughly deserving victory, in my opinion." Match ends, Eastleigh 0, Grimsby Town 1. Second Half ends, Eastleigh 0, Grimsby Town 1. Attempt saved. Craig McAllister (Eastleigh) header from the left side of the box is saved. Attempt blocked. Yemi Odubade (Eastleigh) right footed shot from the right side of the box is blocked. Attempt missed. Ollie Palmer (Grimsby Town) left footed shot from the right side of the box misses to the right. Attempt missed. Craig McAllister (Eastleigh) header from the right side of the box misses to the right. Assisted by Jai Reason. Attempt missed. Lenell John-Lewis (Grimsby Town) left footed shot from outside the box misses to the right. Substitution, Grimsby Town. Danny Parslow replaces Christian Jolley. Attempt missed. Ollie Palmer (Grimsby Town) right footed shot from the right side of the box misses to the right. Offside, Grimsby Town. Christian Jolley tries a through ball, but Christian Jolley is caught offside. Attempt saved. Shaun Pearson (Grimsby Town) header from the left side of the box is saved. Assisted by Nathan Arnold. Substitution, Eastleigh. Craig McAllister replaces Brian Howard. Attempt missed. Ollie Palmer (Grimsby Town) header from the left side of the box is too high. Assisted by Christian Jolley.